Despite our original plans of spending a mere two days in Bombay, train schedules forced us to do double that…and it couldn’t have worked out better for us. But first, a little background. We stayed in the Colaba area, which is very popular with the tourist crowd and full of Bombay’s most famous landmarks, many of which were involved in the November 26 terrorist attacks. Our hotel room was overpriced ($10) and consisted of four wooden dividing walls between other rooms and a fan above. There was no ceiling and no privacy and the area of the room that was not a bed was maybe 2 feet wide. Once our backpacks were in, we had a 2×2 space to stand in or we had to sit on the bed. This just motivated us to meet more people and spend less time in the room. It started when my old fraternity brother Neal put me in touch with his friend Ben who was living in Bombay. Ben then invited us to a going away party for a member of the investment banking community of the city…aka, foreigners like us but with way more money. The party was in a ridiculously nice high rise apartment overlooking downtown Bombay and had a full bar with three bartenders pouring drinks and bringing around snacks. We partied until nearly 4am, talked to everyone in the place and made a bunch of new friends. The next night we wanted to experience Bombay nightlife, so after a complete stranger came up to me on the street and got us on a guest list, we called Roshni and Arnaz: local Indian girls that Carrie befriended at the party. The place wound up being some cheesy USA music club (guess that explains why I was approached) that we quickly left with my new promoter friend and went to a more swanky place called Red Light. Despite advertising itself as a club, I would say it was more of an upscale bar with a packed dance floor. Drinks were even more expensive than in New York City, with a rail rum and coke costing at least $10. So, drink free (except for the homemade rum and coke we had on the steps outside), we proceeded to dance until around 2am. Two days later we met up with Roshni and Arnaz again and this time they took us on a mini-tour of the city via local bus. 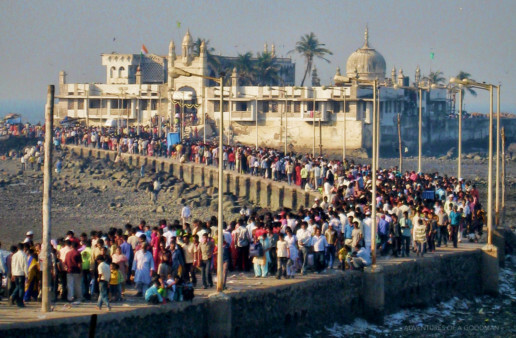 Highlights included the Tomb of Haji Ali, which was a massive Mosque in the middle of the ocean and, due to low tide, beyond crowded, and Malabar Hill, which had a great view of the city and the ocean. The girls also introduced us to paan, which consists of chopped nuts, a red paste, slaked white lime, a mix of sweet spices and a cherry on top, all wrapped in a triangular shaped leaf. The idea is that you chew it and swallow the juices, which help with digestion. It was one of the most vile things I have ever tasted and after a minute I had to spit it out. Carrie spat hers out too, but didn’t hate it as much as I did. Sidenote: paan is often served with chewing tobacco and the streets of India are stained red as you must spit out this type and the paan turns your saliva and tongue blood red. Finally, the girls ended the day with a little jewelry shopping before they escorted us all the way to the train station to say goodbye. However, now let’s go back in time a little to discuss some of the other wild experiences we had in Bombay.